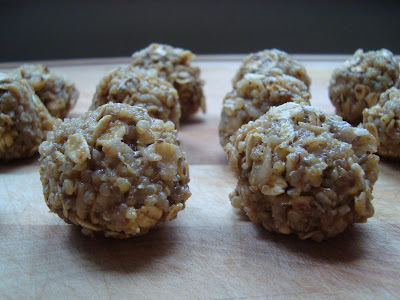 Like Power Bars, they’re Power Balls! I’ve recently been experimenting with making healthy, whole, full protein, gluten free workout snacks…and these I think are a winner. Just one will sustain your energy for at least 2 hour workout. 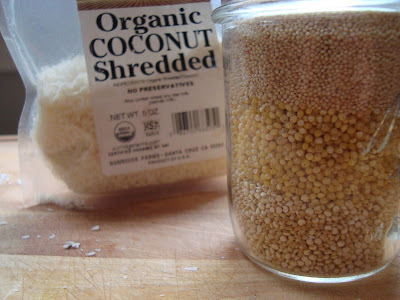 I had a bowl of cooked grains (quinoa, millet, amaranth) in my fridge that I had made the day before and decided to use this as my base. So I decided to go with a nut butter to hold the grains together and provides a good source of protein and healthy fats. I also prefer almond butter over peanut butter because it has more vitamins and minerals. 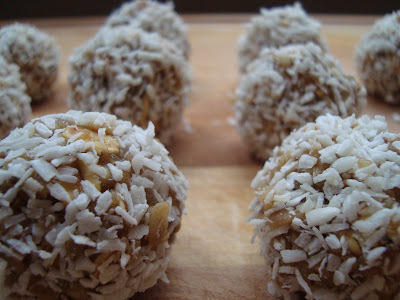 Now that we have chosen the carb and protein (grains and almond butter) I decided to roll the balls in coconut as a source of natural sugar. The coconut also helps hold the balls together and keeps from getting your fingers sticky with almond butter… not necessarily a bad thing. You can use any grain here, even rice. I recommend using quinoa though because it is a full protein (containing all 9 essential amino acids). Quantities here, like most things I make, are not important at all, you have complete control here. If you prefer, walnut butter, use that. If you prefer cocoa, roll your balls in that. The possibilities are endless. Keep in an airtight container i the the fridge for, well I’d say forever- but just to be safe, 3 weeks! Now Go and Run a Marathon!